New technology used in providing safe drinking water is contributing to the damaging effects of global warming, writes Peter Fisher. 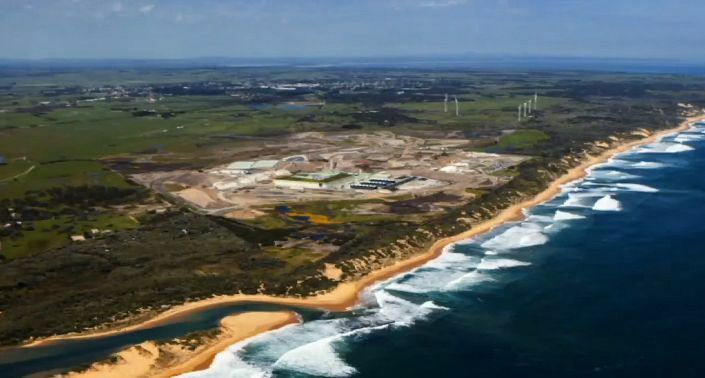 AMID THE TALK – at least in the developing world – leading up to World Water Day last Friday was yet another example of the intersection between water and a climate stressed out of its socks — the switching on of Australia’s largest desalination plant at Wonthaggi (not to forget Sydney’s Kurnell plant which is also about to come online). Fires in Melbourne’s Thomson catchment impacting water quality – if it really rains, that is – and half-empty dams are cited as the reason for this recourse to a technology with problematic credentials. Events like the Townsville floods, the heatwave in FNQ and the stinking mess of the Darling are signs that climate change is playing out in uncharitable ways in rural Australia. Meanwhile, down south, cities like Melbourne, after recovering from the Millennium Drought, are beginning to succumb to a run of record temperatures — desiccation now afflicts home gardens and parks with many trees and shrubs on life support (only 8mm has been recorded so far this month). Away over the hills to the east, the forests at the epicentre of the city’s regular smoke haze are struggling to maintain their ecological integrity and diversity with 195,000 hectares burnt so far this year amounting to a loss of 5,000 hectares per day. Whilst Eucalyptus woodlands would possibly hold their current range, they could still be vulnerable to more frequent fires, especially when El Niño droughts compound the effect of global warming. Moreover, fragmentation of ecosystems would limit the ability of plant communities to colonise more hospitable areas. In other words, the vegetation may be transitioning to something else of unknown consequence. The protection of water catchments is front and centre at this point in time — not only the Thomson but that of Armstrong Creek which feeds into the Upper Yarra. The Canberra experience of 2003 offers a precautionary tale for when a bushfire burned through 98 per cent of the Cotter catchment, heavy rain a few months later washed huge amounts of contamination into the Bendora Dam. The A.C.T. Government then had to commission a $40 million membrane bioreactor treatment plant to restore water quality. There are a number of caveats: Regrowth of mountain ash after a fire (or clear felling) can set a 40-60 year timeline to restore original yield; if the soil is dry, precipitation will not reach the waterbody until it is “wet”; but if it has become baked hard, torrents carrying rocks and other debris may do so. Where to for the future of supply? Opinions vary as to whether recycling rather than new dams or desalination could meet the needs of expanding populations, or at the very least offset supply shortfalls. Further, that once-through-water-in-use cycles are very wasteful. The industry even has a term, “fit for purpose”, which infers that biota and other organisms are less susceptible to stuff (essentially pathogens) otherwise considered harmful to human health. The loose application of that principle has, in retrospect, got us into trouble. PFAS, or perfluoroalkyl – a compound used in firefighting, non-stick cookware, food packaging, insecticides, waterproof and fire-resistant fabric – is currently a centre of public concern, especially in the vicinity of air bases. It does not biodegrade and thus can accumulate in ecosystems and move up food chains, accumulating in animal and human tissue where it has been linked to bladder and liver cancer, endocrine disruption and developmental and reproductive toxicity (including neonatal mortality). New research has discovered that PFAS is only partially stripped by local Waste Water Treatment Plants (WWTPs) and is therefore likely to be present in water reuse projects based on class A effluent. Australia’s WWTPs vary enormously according to age, level of expertise and design standard. Even the best ones don’t remove all foreign chemicals. Advanced treatment processes are designed more for removing pathogens than for breaking down molecules, although chlorination and what’s known in the trade as “ozonation” do have some ability to change the chemistry of, for example, drug molecules (to exactly what is unclear). Further investigation has revealed that PFAS is present in all groundwater samples impacted by class A recycled water, taken from Melbourne’s Western Treatment Plant. This water is piped to Werribee South for irrigation of market gardens, where the highest concentrations were found at the centre of the irrigation district. Given what we know about soft tissue vegetables like lettuce being a resting place of feral drugs, it’s possible that PFAS is present in shelf items drawn from that district. The capacity of these vegetables to absorb vis-à-vis adsorb microcontaminants is likewise corroborated by new American research showing pesticides are present in fresh produce even after washing. These revelations underscore a perception that after more than two decades of research, the impact that things like pesticides, pharmaceuticals and personal care products (PPCPs), drug-related compounds, food additives and, of course, PFASs might be having in receiving environments is often overlooked or underplayed. This is evident in the January usage of fire retardants in the Thomson (drinking water) catchment — when dropped in the Caledonian Valley in the Alpine National Park in 1998, they left a gooey lining on stream banks. A decision to upgrade the treatment plant at Bolivar near Adelaide, which supplies recycled water to the fresh produce export venture at nearby Virginia, is a tacit recognition of a need for greater purity of recycled (irrigation) water. However, the improved treatment measures, especially the use of RO (reverse osmosis), come with a sizable lift in energy. Coupled with desalination plants, the rising challenge of delivering a reliable and safe water supply means that the industry’s energy use is growing. Moreover, as climate change puts yet more pressure on water infrastructure, the industry will increasingly become both a contributor to and a casualty of climate change — its core assets will be vulnerable to wildfire and/or accelerating sea level rise and storm surge. Can it therefore stare down global warming faced with the prospects of cities like Melbourne in danger of running out of water by 2030, especially in the light of unremitting population growth? We, as a society, permit the random distribution of unknown propriety substances but only halt their use once several years of actual impacts are recorded. The messaging here is that humans are, as a biological entity, not apart from but intricately immersed in that receiving environment foremost through the intake of food. Hopefully, this will lead to an application of the precautionary principle (remember that?) ahead of applying fit-for-purpose criteria. Chemicals like fire retardants and pesticides have unspecified propriety ingredients, whilst PFASs’ human health implications alone necessitate eliminating them from recycled water whether that be for direct potable reuse, irrigation or other applications, to be followed where practical, by careful disposal of any residues. Moreover, in view of new formulations and the fact that some environmentally-sensitive areas are protected from retardant use, there’s a need to test for other possible effects. Melbourne’s closed catchments are in a rather precarious position — delicate places protected as they are by high fences. Perhaps these protections should extend skywards? Dr Peter Fisher is an Adjunct Professor at the School of Architecture & Built Environment, Deakin University.